And what a splendid Friday it is! The Girl Friday Ink Squad! that was created by Girl Friday Kelly of the challenge team! Check out this amazing card! The line stamp reminds me of the lines in a UPC bar code, so I thought I'd make one with a custom happy birthday sentiment. I showed it to my husband, and he said UPC codes have numbers in them, not letters. Bah humbug. Creative license, my darling! 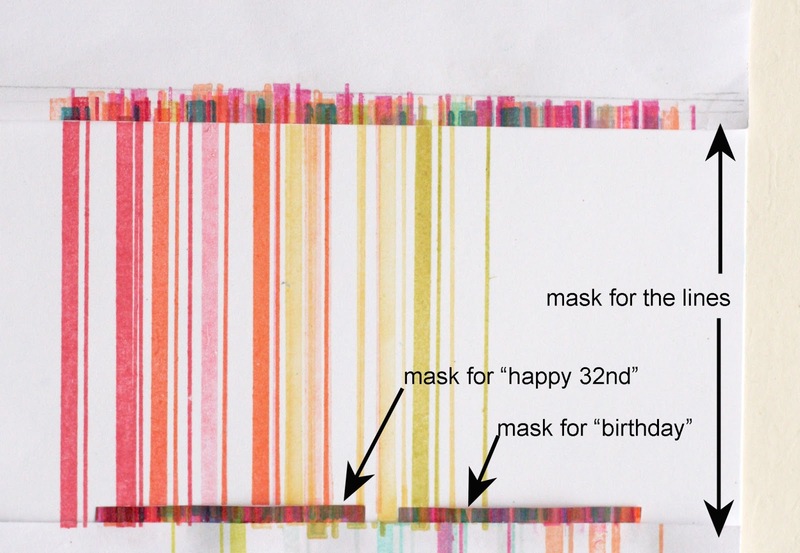 I printed the sentiment from Word (added a space between each letter) and then made two rectangular masks to put over "happy 32nd" and "birthday." The long masks for the lines on the top and bottom came in handy too. Then I opened all my ink pads and just started stamping down the color wheel. I've been stamping for many years, but had never known about the Fiskar's stamp press until watching a Papertrey video recently. It almost feels like cheating! To be able to stamp with right angles and parallel lines every time ... heaven! While I had the mask all set up I printed off some more card bases for upcoming birthdays, and stamped more rainbow bar codes. I did one in blues for a man (rear right) and one in grays with a pink section pointing to the age (front right). 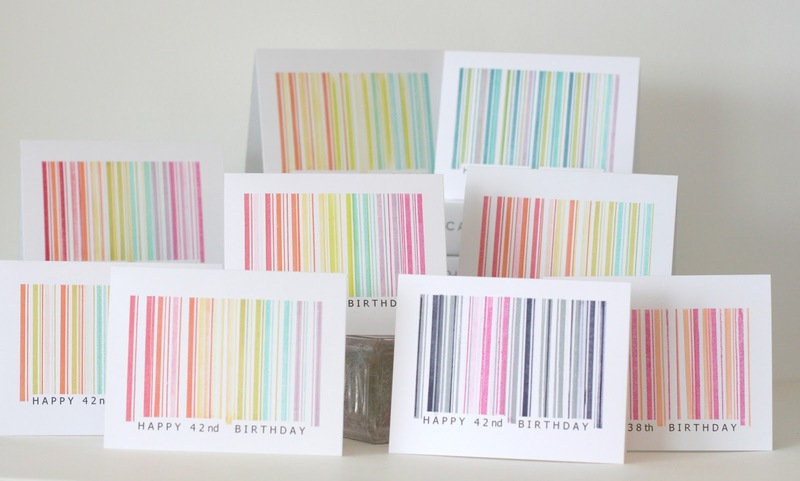 This would also be a fun set to give someone too if you make different color combos and take the age off. Don't those all look awesome!? I want to try this soooo bad! 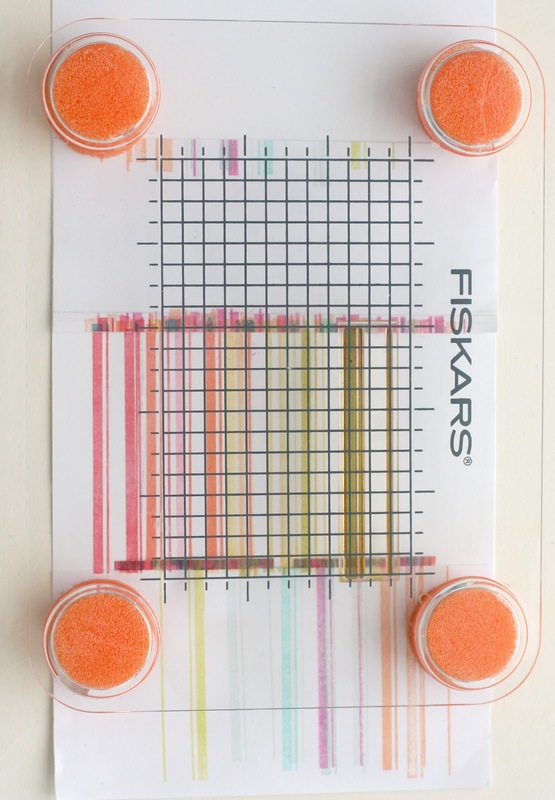 And I think I need that Fiskars stamp press! Be sure to stop by her blog, and leave her some love. Have a very inky weekend!! Kelly is so clever! 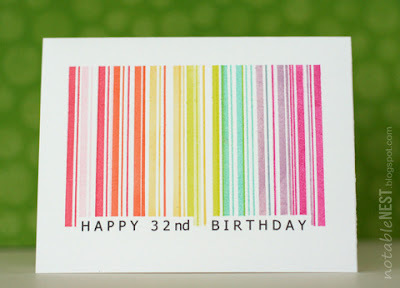 I love this idea, and you could so easily use it for any occasion! Kelly blew me away with her creativity on this one! This sure is AMAZING! *thud* Brilliant and creative and an incredible first post! Woohoo Kelly! OK, this is so Kelly. I LOVE these. The graphic nature plus the cool colors. And - I was disappointed when a bar code stamp I was hoping to get (another stamp co.) was out of stock, but Kelly's provided a work-around. What a gal! Jaw in lap! Wow these are fantabulous! Just brilliant! I love the rainbow colours and the graphic look to the cards! This is solo awesome, I love the idea! Newest follower here! Love this blog!